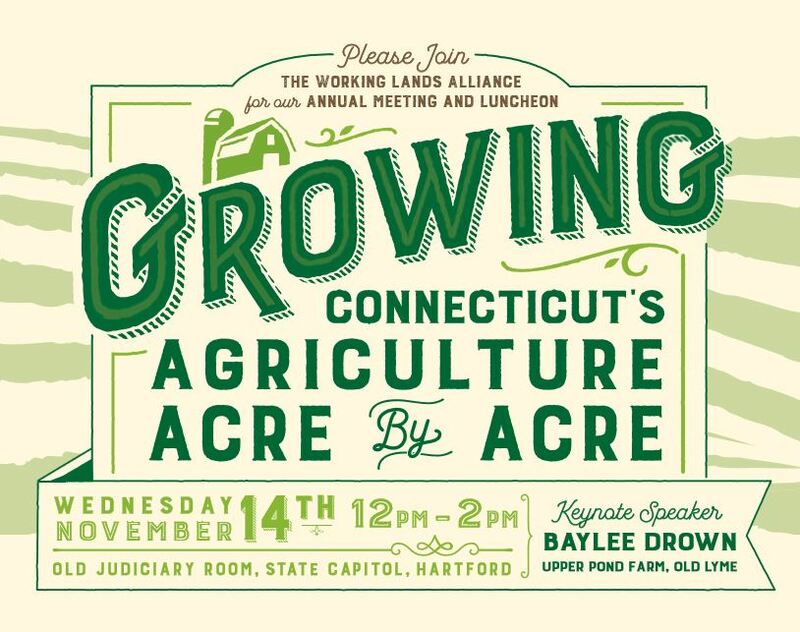 This year, the Working Lands Alliance Annual Meeting theme is “Growing Connecticut’s Agriculture Acre by Acre.” On Nov. 14, leaders from across the state will come together at the State Capitol to celebrate the impactful accomplishments of the past year and present WLA’s policy priorities for the 2019 legislative session. The Annual Meeting will also include the presentation of the 2018 Farmland Preservation Pathfinder Awards. Established in 2003, these prestigious awards recognize individuals and groups in Connecticut that have significantly advanced farmland preservation through leadership, advocacy, planning, and education. Award winners over the last fifteen years have included municipalities, land trusts, farmers, town boards, and many individuals and groups who have shown an impressive commitment to protecting our vital farmland in Connecticut. Table sponsorship is $150. It includes two tickets, table recognition at the event, special thanks in the event program, and a $110 tax-deductible donation to WLA. Individual tickets are $20. Advanced purchasing of tickets is strongly encouraged as space is limited. We hope you will join us for a thoughtful program and locally sourced lunch that will be served by the University of Connecticut’s talented dining services. To the many organizations that sponsor this event, thank you! For further information about how you can sponsor a table or buy a ticket to our annual meeting and luncheon – click here.